Dickson poppy fields at CSIR Dickson Experimental Station in the Australian Capital Territory. Two Land Army girls (Marge Craig and Lea (Jea?) Stevenson illustrating the height of the poppies. From Shaping Science and Industry - C.B. Schedvin 1987. "By 1943 Australia was more or less self-sufficient in morphine. The ancient method of obtaining opium from the poppy heads could not be used because the procedure was so labour intensive. Instead, morphine was produced from dried poppy heads and poppy hay." From 75 Years of Australian Science Booklet: "CSIR was involved in the development of a method to estimate the morphine content of the opium poppy. Experimental trials were held in the ACT, Victoria and WA to compare the performance of different variants. 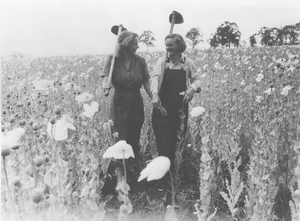 The Australian Women's Land Army grew opium poppies for the war effort".